A native of Australia, Bennett spent 12 years as an Australian rules football player, primarily with the West Coast Eagles (Perth) and Melbourne, before retiring in 1993. He arranged a tryout with the Chargers on a trip to the US and spent a year on San Diego’s practice squad in 1994. Bennett spent the Spring of ‘95 with Amsterdam in NFL Europe and averaged 38.9 yards on 59 punts. Chargers went 9-7 to finish second in the AFC West and qualify for a Wild Card spot in the postseason. Lost AFC Wild Card playoff to Indianapolis Colts (35-20). Bennett lasted a total of nine seasons with San Diego, following up with a 45.6-yard average in 1996 and reaching the Pro Bowl for a second time in 2000, a season in which he led the NFL with an average of 46.2 yards. His hang time was outstanding and he improved his consistency and ability to place his kicks over time. A remnant of his years in Australian rules football, he did not shy from physical contact. Bennett also utilized the “drop punt” technique to good effect in situations where placement was more important than distance. With Mike Scifres waiting in the wings, Bennett moved on to Minnesota as a free agent in 2004 and, after initially being waived in the ’05 preseason, finished up his career as a one-game replacement for the injured Chris Kluwe at age 40. 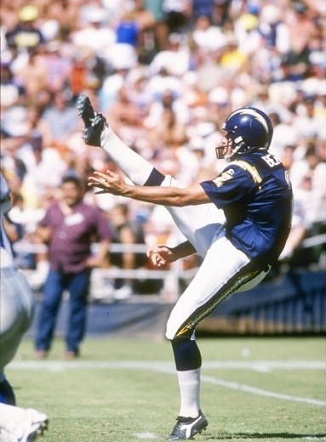 Overall, he averaged 43.4 yards on 836 punts, 771 of those punts for a 43.8-yard average coming with the Chargers. Bennett was inducted into the San Diego Chargers Hall of Fame and named to the All-1990s team by the Pro Football Hall of Fame.